My father-in-law opted for cremation, which meant that when one of his kids wanted everybody to put off the funeral for a month to when her kids could more easily come, sure, that worked. But that is why we were in town when David was. That is why we were in town just in time to see our nephew Taylor and his family on their way out. Ordinarily, we would have been there and gone well before any of them showed up. And I wouldn’t have wanted to miss seeing them for anything. My sister’s son and his wife had a baby at Thanksgiving, and they were flying to, you guessed it, Salt Lake City from Atlanta that same week to show off the baby to her dad. We so wanted to see them and to meet their little boy but the overlap time on our trips was tight. We got up early (our time) Friday morning and hoped that the rush-hour traffic would allow them to make it. We chuckled. Hey. Babies’ superpower is wrecking your walking-out-the-doors. It is amazing how much living can cram its way into fifteen finite minutes. It was a privilege to see the two of them so happy in their new parenthood as their wide-eyed little one took in the new faces and scenery around him before being whisked off to the crowds and the skies and at last, home. We are home today. So let me first tell you one story that was not from the funeral. My cousin David was flying in to Salt Lake City and was going to be playing piano at our aunt’s house. Now, when I say piano, you have probably never heard someone who can play like he can. I’m quite serious. And that house was built by our grandfather and concert-pianist grandmother so as to bring out the best in the music. He invited all the cousins to come who could and offered to accompany them for anything they might want to sing or play. David being the one who, as a teen, would spend two hours on public transit to watch a show on Broadway, two more hours to come home, and sit down at the piano and play every piece he’d heard note-perfect. And now he’s a professional composer and musician in New York. It just so happened that our trips to Salt Lake were happening on the same weekend. I showed up late, with apologies; the funeral and family reunioning afterwards had gone into overtime and I had needed to be there, too. (Richard, grieving his father, decided on one-on-one time with my dad, who was not up to going to that, too, while I went to the concert. My mom was already there.) There were lots of people and lots of chairs set out but I saw none that were empty and simply plunked myself on the floor by the door. No biggy. It’s about the music and the people, not about the seating. Aunt Joyce stopped David (who could not see me from behind a wall) between pieces and motioned over to me: there was an empty chair over here for me, and here, let’s set up more over near the kitchen for any other latecomers. Which were indeed put to use. Now, there were several rows to the right where she was and then there was this one single chair forward of everybody else and kind of in the musicians’ faces. And that’s where they put me. Close to the piano, close (and almost in the way of) the vocalists. At least two of whom sing professionally on Broadway and, wow. Sitting there was like I had my old hearing back. David declared it the last piece, and after that, stood and invited everybody to join him now for cake. It was his birthday, a milestone birthday at that–I’d had no idea. Well then that makes this all the better. I caught his eye from up there in my front row of one and kind of raised a finger halfway in a gesture of “wait” and then hesitated a moment, because this was his party, his celebration, his gift to us, and I didn’t want to distract from that in any way. And yet it just seemed a good time. I had mentioned no such thing to him while he was planning this. He was surely jet-lagged–it was quite late his time–and he had no idea what to expect from his musical cousin who had lost most of her hearing. He looked afraid that this was somehow going to turn awkward, or, or what, but I was pulling this on him after he’d already said the playing was over and he didn’t know what I was up to and he wasn’t quite sure how to react. And then I reached down to my unzipped purse and quickly handed it to him kind of folded and scrunched inside my hand and watched his face as he realized what he suddenly was holding. The surprise. What it was. The crowd roared as it saw. I wanted to say it was from all of us here in thanks for what he’d just given us but I didn’t want to interrupt him in that wordless moment. I had wanted to make him one for a long time, and the chance to give it to him in person got it to finally happen. A little later, as people were chatting and enjoying that cake, Aunt Joyce, who teaches flute, plays professionally herself, and who’d done a duet with him a few minutes earlier, asked me how long it took me to make that. She was quite taken with it. I don’t yet know how to make a flute hat, but clearly pianos were acceptable–and so I pulled a second one out of my purse, with brown at the brim and the top that made it go perfectly with the outfit she had on. What I didn’t tell them was, I had made that three-color one first. It was in a yarn new to me that took some tweaking of how I usually knit that pattern. I wanted it not too thick looking but quite warm. I liked it–but it came out just a tad slouchy and it seemed not quite the thing. It was good but I strongly felt it needed a do-over. Take out a row here, here, and these few too. I felt very pleased after the second one: I’d gotten it right for him this time. So then but who was the other one for? There are a lot of musical people in the family to choose from. I would have to find out. And then when she, the hostess of the evening, picked up his, not hoping nor asking for one in any way but simply appreciating the artistry that went into it, the question answered itself. With “Do your ears hang low do they wobble to and fro can you tie them up in a knot can you tie them in a bow” singing in my head, I offer this little bit of scientific oddity for the day. The phone rang: could I…. I had to drop something off for my daughter. It was dark and raining. I couldn’t see to adjust the mirrors, so I put the front passenger window down halfway to get a better view of that one. The window would not go back up. I tried the others (this may have been stupid) and they were fine. I turned the car off and on again. Reboot? Didn’t work. I debated going back inside and asking for help/advice/commiseration, but there was a tight time frame involved and I just had to go so I did. I stepped in the door at home a little later and told him the problem as I gathered up plastic wrap and tape: at least the rain had mostly let up while I was out there with that down, let’s at least keep the water out, or more of it, anyway. Did you…? he offered helpfully. Did you try it from the passenger side? It might be the battery…? But if the battery were going then it wouldn’t have turned back on so easily and the other electrical things would have had a problem, wouldn’t they? Say a prayer? Other than that we’ll just have to take it to the dealer next week. But try turning the car on again. I had and I had (not the dealer part) but I did and I did, and this time I tried all the buttons on the door because hey, why not: the lock button, the auto button (thank goodness the driver’s window still went straight back up) while sending up yet another prayer, because heck, *I* didn’t know what to do. The rain of course was picking up again. And suddenly that passenger window moseyed on up all casual-like like it had never been a problem. I just kind of sat there and stared at it a moment. I was not expecting that. I ain’t touchin’ it. Neither is he. I think I’ll go put tape across the buttons to remind us. Up it stays. I have no earthly explanation really for that either. Oh and did I mention my dad spent the night being checked out in the cardiac unit at the hospital? They sent him home yesterday and he’s peachy fine. One funeral of a father at a time is enough, thanks. Sometimes, at the end of the day, all you can do is sit down and finish that hat. Something you can mend the splicing effects of if you need to. Something you can rip out and do over in baby size if you have to. Something you can make do what you want one way or another even if you have to change what you want out of it to get it. And I didn’t even have to do that. For non-knitters and knitters alike: this is delightful. A village that knitted their village. For the knitters: this is brilliant. And instantly so obvious. It’s one of those, why on earth didn’t I ever think of that?! Awhile back, maybe two years? Colourmart had a dk 50/50 merino/silk in a cheerful chestnut brown, almost sold out, that I knew was exactly my friend Phyl’s color. So I hinted, and at the time she said she wasn’t into cowls. Fair enough. But I bought a cone anyway while I still could because the shade was so perfectly her. A week ago, I pulled it out of the stash and wondered out loud in her presence if that reluctance still held. “Oh, that’s my color!” And yes, yes she would quite like a cowl out of that, thank you! So yesterday, I showed her the project at the halfway mark: did she want me to continue going straight, or fan out? 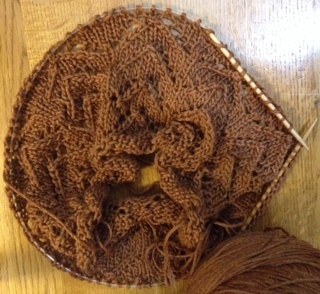 …And it is finished and drying and I learned how much I like how that just came out and I intend to do that again–if nothing else, so that I can get it written down as I go, so that I can then test knit it from that written-out, etc etc. The plain no-brain hat that I started after dinner, meantime, is well on its way. I didn’t take this one to church last week. I couldn’t tell you why not, other than the passing thought of maybe I’d keep it for myself. The way the yarn was spun makes it look a little bit nubbly but it is marvelously soft and I love the color. Yeah, I didn’t believe I would either–because I knew there was enough yarn left to at least make a smaller version. But still, that merino/silk stayed home. Not today. Today it definitely insisted it was coming with me. I thought I was ready to head out the door to church but it called me back somehow. Okay. I walked halfway across the house and retrieved it just in time. Note that she is the mother of three small children. Note that this week, her husband’s been out of town and she’s been coping with the kids missing him as much as she has. (I saw one being weepy and remembered those days.) Note that this week is the week, it turned out, that she broke her wrist, while trying to hold everybody together in his absence. She didn’t need that cowl last week. She needed that cowl this week. It’s not just about the color. Richard was at the wheel. We were past the toll booths, the marshes were at high water just a few feet below the freeway, and almost to the bridge over the Bay. Tucked right at the water’s edge there in the strangest location–with no turn-around at a one-lane dirt road running a short distance between where the shore and the freeway give it just that much space from the Bay, and a mystery unto itself–is a shack with the call sign announcing that it houses a radio station. And coming in at the top of that shack, wings wide, swerving sideways at the last with talons outstretched for a fight, was a peregrine falcon! Right there! A second one (there! There were two!) standing on the roof seemed to start to respond in kind but flinched at the last and scrambled away. Which was the tipoff that it wasn’t an exchange of an unseen fish, this was over territory. Well, that’s one way to change the station. In that blink we were too far past to see more. Five skeins (four of those, and one 80/20 baby alpaca/bamboo) bought at Green Planet on Tuesday. I have small remnants of the first four and one repeat’s worth left on that fifth, and I really want to finish this cowl but my hands need to stop. It’s the chunky baby alpaca blend, super soft, and I thought I was just going to get it started so as to have a small carry-around project for tomorrow. It kept insisting, You need to knit me right now! and the next thing you know I had nearly run out of yarn. A hat and almost a cowl (I might yet. After the icepacks. Maybe) in one day. For me that’s a record. But the camera on the phone is in no-go-mode so I can’t show off. Maybe I should confess that the thing landed out of my purse onto the front of the car while I was out and about and the thing is so old that no self-respecting car thief bothered to touch it. I knew when I saw the yarn that that was exactly her color. And she likes to bake. Caramel bundt cake. Wouldn’t you say? I sent a friend a note today after I ran the ends in: did he want a “Created with pride by…” tag in his? Or did he want to be able to wear it this way as well as the other way? The advantage to the tag is its making the hat traceable and returnable should he lose it–a friend of mine got a baby sweater back that way. See? That’s how you justify procrastinating doing that last obnoxious little task of trying to stab and pull yarn through that small tight strip of fabric–you delegate the decision and then ignore your phone while you blog. I somehow inexplicably, completely and utterly forgot that you’re supposed to spray the dormant peach trees with copper to head off peach leaf curl disease. Which three of my trees got hit with hard last year with all the rain we had, even though I did spray then. The disease can only take hold at cold temperatures on wet, new, growing leaves, but it can kill a tree and it destroyed all the fruit on those three. A friend who’s a master gardener happened to say something on the subject, with the end result that I hired him to come do it for me. I knew that if nothing else, he would do it right and after last year I was certainly not sure I had. It’s been warm during the day the last few days and turns out those same early peaches were starting to come to life again. They hadn’t broken bud yet though, so the job could still be done. We just made it. And only because he didn’t have quite enough copper to finish his own job and wondered out loud if anyone had a bit to spare, to save him the hassle of buying and storing a whole big thing of the stuff for a year when he only needed a few spoonfuls’ worth. I responded with, Sure, I do– and then– !!! She chose the black one. And I took the beige home for now so that the next person would be able to choose from a selection of more than one, too. Simple patterns, potato-chip knitting, but in yarns you want to reach out and touch. Here, let me finish this hat for Lee and I’ll start the next one.